A classified government document opens with “an odd sequence of events relating to parapsychology has occurred within the last month” and concluded with an alarming question about psychics nuking cities so that they became lost in time and space. If this sounds like a plot out of science fiction, it is - but it’s also a NSA memo from 1977. I wonder if Einstein or Oppenheimer qualify? The separation of church and state keeps the NSA from believing in such nonsense. They must look to the President for their salvation. This explains a few things to me. I was wondering the purpose of the horrible underground expiriments seemingly geared toward traumatizing. I heard tale it was to be involuntarily used for psychic abilities, but it was only a fitting explanation which this document may confirm. Also I believe the correlation is correct, i noticed a spate of poltergeist-like activity when going through a traumatic time and I definitely don't believe it's ghosts. I felt there was a correlation as everyone ive heard speak of these occurences experienced it during mental turmoil. Now the question for me is what is this displacing a city in time and place bit about, and where can we find evidence of this having happened or been attempted and what does it even mean really. Is this related to the mandela effect? The report cited British scientists experiencing “poltergeist phenomena” after testing Uri Geller. That whole dog and pony show was a KGB attempt to get the Puzzle Palace to waste time, manpower and money and keep their thoughts away from other things. Especially the Soviet space program. Uri Geller mostly known for bending spoons, as all magicians he uses trickery in order to simulate psychic or paranormal ability. Magicians profession is built on deception and to exploit the human weakness of perception and memory. That being said. CIA, KGB, and other govt agencies have sought after osu phenomena with the hopes of creating a wood i.e. took during war fare or espionage surveillance. That is interesting who told you about the activity before you arrived? I see what you mean, it seems to be in specific locations. I know since i moved nothing has moved or disappeared since and it was a very old house with many passed occupants and a draining feeling. Somehow im still a little undecided though i still consider the possibility of some sort of residual energies rather than a conscious effort to wreak havoc by a wayward spirit. Every case seems to point do a different answer though. Yes i believe they have and may still use citizens for that purpose. It was already stated that is how the bombardment of bombing of underground refuges osama did was so precise. Correction - my girlfriend and I were already living in the house 2 yrs matter of fact when finally we caught up with a previous tenant i.e. family. Husband, wife and three children. Took me awhile to find them but I did. The wife told me they had activity, weirdness, and strangeness. Skeptics ignore the fact that she said the "house was a living hell" while they lived there. The darkness in the house drove her to commit suicide a few times. She tried and failed. They experienced some of the same activity my girlfriend and I experienced. It should also be noted during the time they experienced this my girlfriend and I wasn't even together. We hadn't even met yet. That family lived in the house 2008:2009. Girlfriend and I met on April 15th, 2010. Moved in the Bothell hell house May 1st, 2012. I know since i moved nothing has moved or disappeared since and it was a very old house with many passed occupants and a draining feeling. how long were you in the house? what all did you experience? what's the craziest thing you've seen or experienced? Ive been in a couple seemingly haunted places but the last place i was in a few years had the poltergeist type activity. I thought my house always got out of order because my son was a toddler but a couple times things moved. One day he had gone next door to my sisters house and i had just finished vacuuming when i popped over to bring him a snack. Came back 2 minutes later and there were toys strewn everywhere across the floor. The weirdest to me was when i was running my sons bath and he got in. I heard a huge crash in the living room and i came out to find his two tubs of hotwheels upside down. It was the manner it had happened that was so impossible. The tubs were in the bottom shelf of my entertainment center. They were very heavy and too large to be able to tip out, because of the tight fit they had to be slid all the way out before they could even possibly tip like that. But sure enough they had simulaneously both flew all they way out and turned upside down. Also this house wasnt accessible from the street, nobody could have popped in. In another residence i lived in i experienced a childs voice. Tapping on my bathroom doorknob when home alone and lights going on/off at opportune times. The weirdest thing there was a time my boyfriend had turned the faucet on and left it. I walked in and turned it off. Then as we were standing next to the sink and i was b****ing about it the knob just turned and the faucet went on full blast again! In a house my dad lived there was a terrible energy even non superstitious people were afraid to go upstairs. It gave me odd nightmares id awake thinking i saw weird things and heavy footsteps would walk up the staircase. Sevetal times when they reached the top me and my sister both came out thinking it was my dad but it was nothing. The occurences stopped after he remodelled. It is a very old house known for the crazy lady who lived there in the pioneer days. My dad is scientific and very skeptical of anything paranormal but he said that the occurences stopped when his ex wife moved out, so i know he noticed it! Whatever it was it is completely gone now. So that sums up my history of haunting type events although i still dont fully accept ghosts at face value. Wait i have one more but its not connected to a house. I had a really close friend who threatened to haunt me as a sort of joke pertaining to the guy i married. Shortly after he was shot. He peddled his cds for a living and introduced me to all my favorite artists... Apparently practically all rappers are related anyways one day my ex husband came to visit me and the topic came up and we talked about how he said he would haunt me. Sure enough as we were talking my sons keyboard started playing itself. It kept happening for a day. Like multiple notes strung together. I couldnt figure out why but it never did that again after that day. 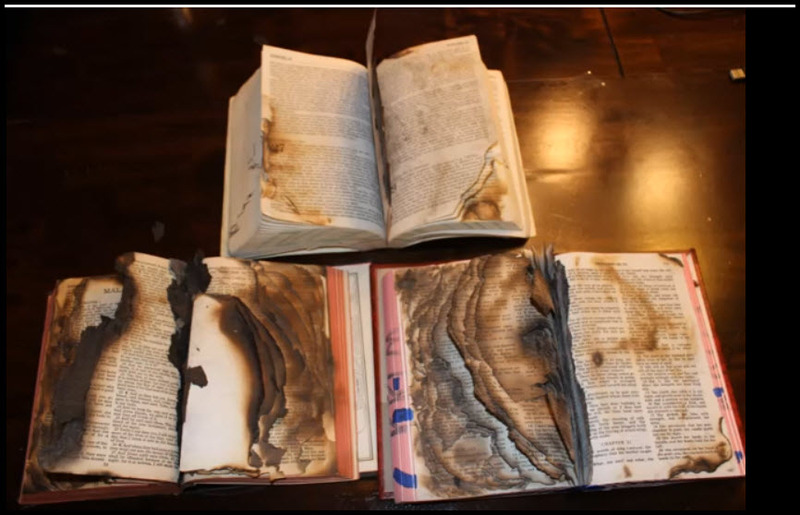 So what are we looking at in the top picture and how did those books burn? Energy residue was much better understood 50-70 years ago. I think our film industry with its obsession of ghosts and paranormal events has damaged our understanding on these matters. The indiginous around the world very much understood that principal. They even knew how to place that energy residue into the rocks of their sacred places. May I also say that for sure we do have spirits around us constantly. However they are not ghosts. That is another story. So you studied with Indigenous Peoples? Speak our languages? Know our concepts? This is complete horse manure. I don’t know Piney, Carlos Castaneda -pre-tensegrity-wrote of something similar and after reading a few of his books I bonded with the idea that we can poor intention into objects, or even people it seems-from my own experiments at least. I know a bit of karuk, went to many pow wows and such. As i said my hometown was mostly indigenous but all they ever really thinkold me about was bigfoot, not other spirits. Actually it was the pit river natives who insisted bigfoot was a spirit who could be summoned with stones. A close friend of mine had quite a frieght when somebody did this not realizing she was menstrating and apparently it charged her and they had to jump in the car and leave. She was pretty freaked out and honestly iver never seen her scared of anything or tell me any other unusual stories. She showed me the spot where it happened it was near a damn above steep embankment. She was so upset about it having charged up this impossiblly steep slope of rubble. Castaneda was a proven fraud I figured that out when I was twelve. He claimed he stopped and cooked a rabbit while in the desert with a shaman. He would of been dead. All desert rabbits carry a dangerous norovirus. No native will eat them. Objects are just "focusing tools" they have no power in themselves except for the power that flows through everything else. When I carved dance masks, charms and clubs I didn't "empower" them. I brought it out. The power is already there. It's everywhere. whether it's called Maanituu, Orenda, or Skan depending on the tribal group. My people believe Bigfoot ( Miisinghk) is a forest spirit too. I like the way you phrased it and I’m not arguing the fact that Casteneda was a fraud, but whether we consider the act as pouring energy into or drawing energy out of an object is mere semantics as I see it. and where would that personal energy come from and be a part of? I've think you've read my previous posts when helping the haunted about the "Power of Intention". Attention and intention. From my experience it is a part of our own individual finite and hopefully replenishable personally held energy. Though it reacts with the energies around us I still feel the core of this energy resides within each of us. Maanituu is like Q'i. It's everywhere and nobody's personal anything. Like the Force in Star Wars. Some people are better at feeling it and tapping it than others. That's all. I like what you’re saying, maybe where we are misaligned is in what I identify attention and intent as actual energies, you perceive these as something different? Of what I’m not sure? Or perhaps we actually see this topic the same way but are struggling to communicate it properly? For me, manifesting intent requires personal focus and energy that seemed to be held by me and will be diminished if not recharged.... when actively using these energies, whether it be to learn something new or to actually cause change in accordance with my will, i feel physically weaker after an extended time. My eyesight even diminishes. I have found my own interesting ways to recharge, perhaps that’s it. I never own the energy I’m using per say, simply gather and discharge. Like breathing. I never own the energy I’m using per say, simply gather and discharge. Like breathing. Let's move it over instead of clogging Keith's thread.